Deere & Company, AGCO Corporation, and CNH Industrial are three good stocks that may play a significant role in the agricultural-sector recovery. It's been a difficult five years for the agricultural-equipment sector as record harvests have led to falling crop prices and a lack of willingness among farmers to buy new machinery. However, the uptick in key crop prices such as corn, wheat, and soybeans in 2017 is encouraging investors to believe a turnaround in fortunes is about to take place. In this line of thought, let's look at the three best stocks in the sector, namely Deere & Company (NYSE:DE), AGCO Corporation (NYSE:AGCO) and CNH Industrial NV (NYSE:CNHI). 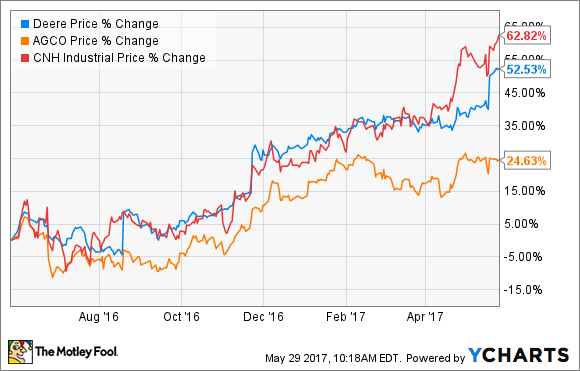 The chart above shows how crop prices have increased in 2017, and the chart below shows the stock-price movements of the three stocks in this article during the course of the last year. Simply put, they have soared as the market has started to price in a recovery in end-market conditions. Indeed, all three have reported better conditions in 2017. It's not that overall conditions are materially better -- they remain weak on a historical basis -- but there's evidence of relative improvement, particularly in places like South America. While Deere didn't make any significant changes to its outlook for the Northern Hemisphere, Director of Investor Relations Tony Huegel spoke of a "very strong recovery" in Brazil. The theme was also picked up by CNH Industrial on its first-quarter earnings call. CNH management merely reaffirmed its full-year guidance for net industrial sales of $23 billion to $24 billion and adjusted diluted earnings per share (EPS) of $0.39 to $0.41. Management also spoke of a "strong rebound in demand in LATAM and the continuation of positive market momentum in APAC." In addition, on AGCO's first-quarter earnings release, management said, "Weak global demand for farm equipment is expected to continue to negatively impact AGCO's sales and earnings in 2017," but it didn't stop full-year net sales guidance being raised to $7.7 billion from $7.4 billion previously. In addition, full-year adjusted EPS is now expected to be $2.70 compared to a previous estimate for $2.50. All told, global conditions appear to have stabilized, and certain markets, such as Brazil, are definitely better. Corn prices need to rise in order for agricultural equipment manufacturers to feel fully confident. Image source: Getty Images. Bottom of the cycle valuations? The investment case for buying into the sector is based on the idea that we will pass through the bottom of the agricultural cycle in 2017. As you can see below, all three companies have seen net income significantly decline in recent years. DE Net Income (Annual) data by YCharts. That's something to consider when you look at valuations. 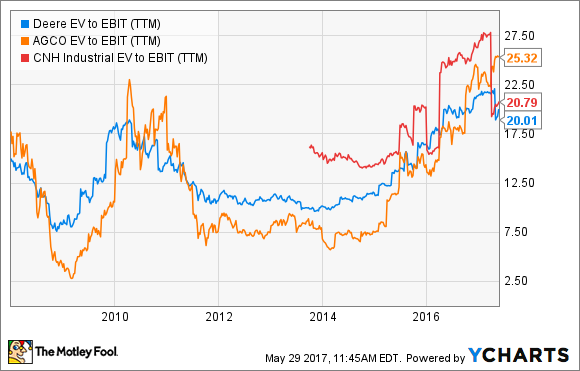 For example, a superficial look at one common metric, namely enterprise value (EV) to earnings before interest and taxes (EBIT) shows that all three look expensive from an historical perspective. DE EV to EBIT (TTM) data by YCharts. However, if 2017 proves to be the bottom, earnings are likely to turn up sharply, and valuations will come down soon enough. 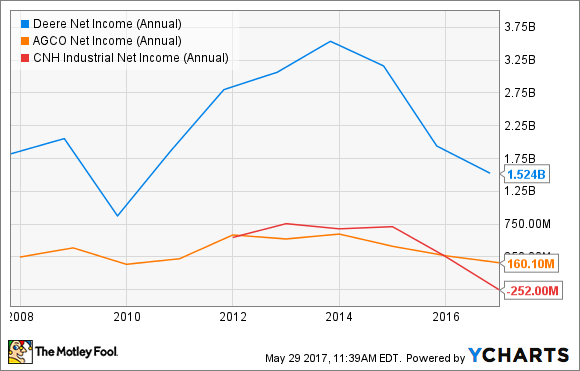 For example, here's a look at Deere's net income in the last few years and its forecast for 2017. Deere's current EV is around $69.5 billion. As you can see below, the valuation multiple will drop notably if net income returns to previous levels. Data source: Deere & Company presentations. Analysis by author. Moreover, as you can see below, according to analyst estimates, earnings at AGCO and CNH Industrial are also set to rapidly grow in the next couple of years. Provided you believe the long-term fundamentals are in place for key agricultural crops to appreciate in price, then agricultural-machinery stocks area a good bet. 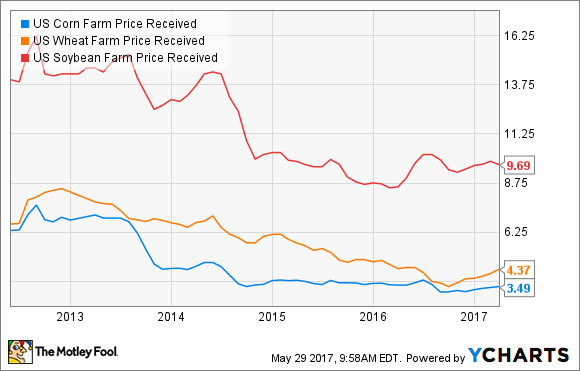 Valuations may look high on a near-term basis, but if you view the last few years as being exceptional circumstances -- four years of near record harvests have led to falling crop prices -- then all three stocks are attractive.